Have you ever felt like something was off with your body, but you weren’t sure what was causing it? When something isn’t quite right with our bodies, we often experience symptoms. Symptoms are the body’s way of letting us know that there’s an underlying problem. On the surface, blurred vision, slow healing of wounds and constant hunger don’t seem to be related. But if you put them together, you might be able to find out what’s really going on. These are all symptoms of high blood sugar. Blood in the human body naturally contains sugar in the form of glucose. The right amount of blood sugar provides energy to the body’s cells and organs. In order to keep blood sugar levels at a healthy range, the body needs insulin. Insulin is a hormone that takes blood sugar and delivers it to the body’s cells. In people with type 1 diabetes, the immune system attacks the cells in the pancreas that produce insulin. In those suffering from type 2 diabetes, the body produces insulin but it is unable to use it properly. What Causes High Blood Sugar? When he body’s blood sugar levels are too high, they begin to create problems. Over time, the blood vessels become damaged, which can lead to many complications. 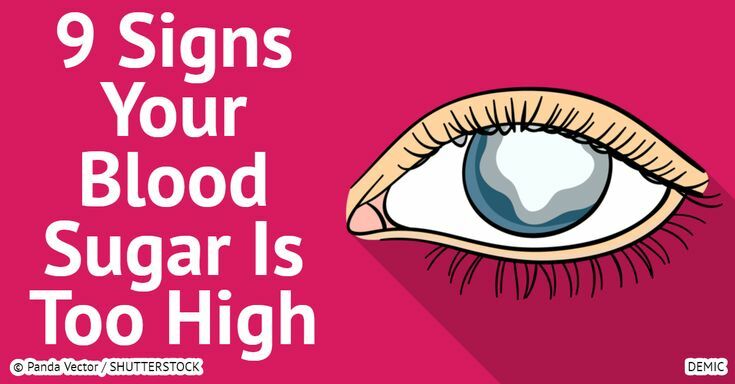 High blood sugar can end up causing a heart attack or stroke, kidney disease or kidney failure and damage to the eyes or loss of vision. It can also create nerve problems in the skin, leading to sores and infections. Being able to recognize the symptoms of high blood sugar can help you catch it early and prevent it from causing permanent damage. HIGH BLOOD SUGAR CAN CAUSE NUMBNESS, BURNING OR TINGLING IN THE HANDS, LEGS AND FEET. THIS IS CAUSED BY DIABETIC NEUROPATHY, WHICH IS A COMPLICATION OF DIABETES. Without the proper amount of blood sugar to give your body energy, you may end up constantly craving food, because your body is looking for an alternative energy source. High sugar in the blood ends up in the kidneys and urine, which attracts even more water. This can lead to frequent urination. Along with frequent urination, sugar in the kidneys and urine can cause increased thirst. When the body’s cells aren’t getting the glucose they need, the body burns muscle and fat for energy instead. This can cause sudden or unexplained weight loss. The same can also be said of weight gain, unfortunately. So it is good to keep an eye out for any type of severe weight fluctuation. When the body’s cells aren’t able to access blood sugar for energy, a person can end up feeling constantly fatigued. When your body is unbalanced, your mind also suffers. High blood sugar can cause difficulty concentrating and problems with memory. High blood sugar can cause damage to the nerves. If you notice your cuts or wounds have been healing very slowly, it might be a good idea to get your blood sugar checked. Dizziness and blurred vision, especially if brought on suddenly, should never be ignored. High blood sugar could be the underlying cause for both of these symptoms.